MAC has a Boxing Day exclusive deal! Get a Free Lipglass with any qualifying lipstick purchase! Buy any lipstick and receive one lipglass shade of your choice online and in-store. No offer code is necessary. *Offer valid through 12/26/2016 at 11:59PM PST or while supplies last at MAC online at the link below and in Hudson's Bay department store locations and in M·A·C Cosmetics owned and operated free-standing stores within Canada. Offer is not available in other department store locations or counters. Valid only on select eligible items, including: classic Lipstick, Intensity, Retro Matte Liquid Lipcolour, Cremesheen Lipstick, Ultimate Lipstick, Huggable Lipcolour, Velvetease Lip Pencil and Mineralize Rich Lipstick. 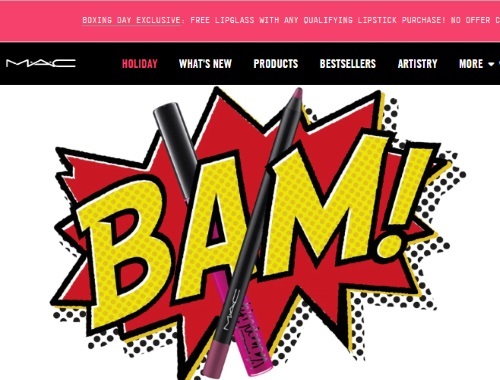 Offer does NOT include the purchase of all other Lipsticks, VIVA Glam, Goodbyes, eGift Cards, physical Gift Cards, Makeup Services, select professional products, sales tax, shipping and handling, items noted as not eligible, items that are not in stock at the time of purchase, pending purchases or purchases made prior to the start of the offer or after the offer ends.